Welcome to Big Muddy CrossFit! Big Muddy CrossFit is not your everyday CrossFit box. Besides CrossFit programming, we are home to Bis/Man Barbell Club, and CardioXtreme classes that will rock your world. Our box is very socially active and participates in events to support the Bismarck/Mandan community. We invite you to see what the buzz is all about. We are certain that you will absolutely love CrossFit and our community of athletes. We enjoy being outdoors, coaching various youth sports, hiking, biking, running, gardening, mowing the lawn, and volunteering. We are both U.S. Army veterans. Chris is a member of Bismarck's Far West Rotary Club. Hey peeps! I received my CardioXreme certification from Foundation Krav Maga and my CF L1 at CrossFit Max Effort. I am excited and invite you to come try a CardioXtreme and a CrossFit class...you won't regret it. Outside of Big Muddy CrossFit, I enjoy playing racquetball (just to hit Chris with the ball), running, hiking, traveling, crafting, and being a super aunt! Kayla is a pretty cool kid. She gets up for the 0530 class, goes to school, plays sports, is the best bassoon player you will meet and still finds time to coach! Be warned, she is sassy and tough and will push you to be your best. Hello CrossFit family! Little autobio for you all! First off, I am from Montana. Grew up in a small town called Glendive. I came to Bismarck and earned my BSN at Mary college; this is where I have made my home and work for a traveling nurse company specializing in long-term care. I have two wonderful children; Maximus and Karisma. They keep me very busy! We enjoy lots of parks, walks and outside adventures! I have been CrossFitting for a few years now. It began as a way to train for long distance running and also to lose some weight. Little did I know it would bring me to the place I am at today. I feel blessed to be a part of such an encouraging community of athletes. When I'm not in the gym or running the kids around you may find me with my nose in a good book, traveling, leading worship in our church band or in the kitchen. I love to cook! Nutrition is fascinating to me! I am passionate about eating healthy and helping others to eat well. One last thing! There are a few of us who have started a group called Faith Rx'd. God and CrossFit, two of my favorite things! We meet periodically throughout the month. There will be a workout and a devotion. Its just another way to plug into life and be of service. I look forward to continuing this journey with all who are willing. If it was not for all of you I would not be here. It has been so fun getting to know everyone! A wise man once said, "We're all in this together". I could not agree more! I am originally from Mandan, ND where I grew up out of town with 2 younger brothers. I moved to Bismarck when I went to the University of Mary for college and have been here ever since. I started doing CrossFit several years ago when a good friend of mine wanted me to go with her to try it out. I had never heard of it and wasn’t interested in it at all. I played sports throughout high school, ran several 10K’s and half marathons, and went to the gym everyday…I thought I was in great shape. WRONG! It only took a little 6-minute workout for me to realize how out of shape I really was. Before I left, I signed up for a membership and was ready to start. Ever since that day, I have fallen in love with CrossFit and what it has to offer. One of my favorite things about CrossFit is that it continues to be challenging no matter how long you have done it. I don’t ever get bored with the workouts and love how it pushes me during each workout. I love doing pretty much anything outside, working out, and spending time with family and friends. I am extremely passionate about helping people achieve their goals and can’t wait to see everyone’s progress! I work full time in the pediatric setting along with coaching part time at Big Muddy CrossFit. I strive to help infants and toddlers, children, women, and men to reach an optimal state of health and well being through functional movement, core foundational strength, along with building a core group of accountability through their community and CrossFit family. I am very passionate about proper movement and physical activity in the community. My goal is to always strive to educate a person and athlete on the significance of breath and core work to further their physical movement and abilities. Whether this be taught through my group CrossFit class or a one-on-one consulting and manual therapy appointment. 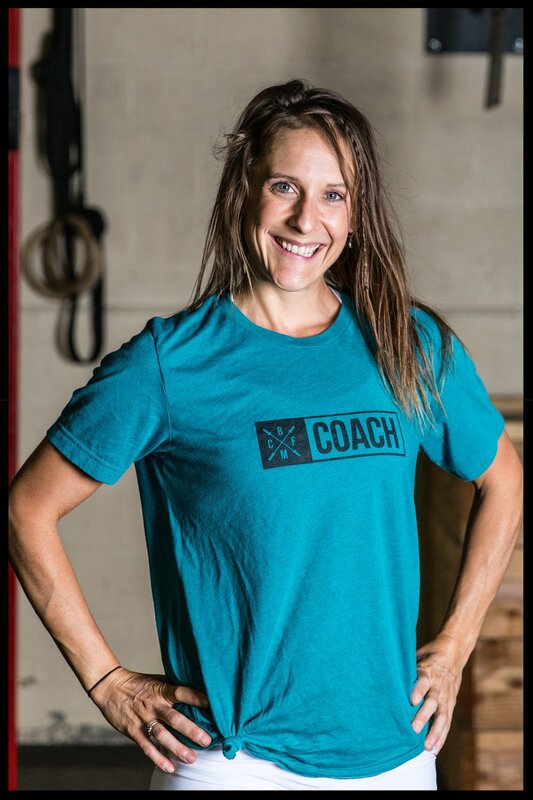 I am an avid CrossFit athlete, which continues to fuel my fire to not improve my own self, but to further learn and grow in my own education in order to provide the best care and coaching to my family, friends, and athletes. My most recent accomplishment was being accepted as a BirthFit Professional. I am so excited to utilize these amazing skills and information gathered from their course to better serve and change the prenatal and postnatal health of our women. Services: CrossFit Coaching, Manual Therapy + Corrective Exercises, and Face-to-Face consults on prenatal and postnatal movement and health, future prenatal and post natal group classes, and appropriate referrals to other healthcare professionals in the community.. I'm not a North Dakota native I was born and raised in a suburb of Seattle, WA. I was one of those kids that could swim before I could walk and dance before I could run. I was pretty much raised on the water so my parents "submerged" me early. I also never walked anywhere either, I spun and twirled to and fro, or at least that's what they tell me! This led to my first exposure to something athletic, classical dance like ballet tap and jazz. By the time I was 8 I was playing softball. Then at 10, volleyball. I played both sports and continued to study dance all through my high school years and even into my early college years. In high school I was introduced to the weight room by my softball coach and never looked back! I fell in love with iron and lifting heavy things. It was something that I could do where my height and smallish stature wouldn't hinder me. In college I really got into weight lifting. I guess it didn't hurt that I had many friends that played football and would push me to be better in the weight room!! No matter where life took me I always had a weight room somewhere. I love me some barbell!! Sooooo several years ago I started playing roller derby and about a year and a half in I realized I needed some form of functional training to take my derby game to the next level. Enter CrossFit!! Man was it hard at first, especially since I had some health hang ups that prevented me from making a lot of progress. BUT I stuck with it because I LOVED IT!! I couldn't, and can't, imagine my life without this community. I have pushed myself beyond any limits I had previously encountered and always come out on top. I am a better person because of CrossFit. True story. And on the personal side..... I have an awesome life with a fiancé that puts up with my crazy self and FIVE animals, 2 pups and 3 kitties. Exercise was always a part of my adult life, but I would cycle in and out of it so my fitness level went up and down. In 1997, I decided I was tired of the roller coaster of feeling good and feeling bad, so joined a popular ‘as seen on TV’ plan. It actually worked great. I toned up, kept moving and stayed with it. The down side was I was always starving on the low fat, low carb eating plan so would run out of steam easily. I kept a very a busy calendar, going to the gym, riding my bicycle, hiking, ran a couple of marathons and thus churned through the years. Then lifekicked me right in the teeth in the fall of 2011 when I was diagnosed with breast cancer. That year-long journey included two surgeries, chemo and radiation and left my body ravaged and wrecked. Another year passed and I was so out of shape, puffy and tired…I just couldn’t stand thinking about what it would take to get back into shape. Worse, I so missed being able to do all the fun things I did before. Lo and behold, I saw a couple of cars with the Big Muddy CrossFit logo on them, so I wandered over to an open house to see what the fuss was about. Here I am years later, healthier and happier than ever. Plus I learned how to properly fuel my body for real life and am never starving, which probably makes me a much nicer person to be around! The joy I feel as an athlete from doing the workouts and sharing both challenges and successes with the people at Big Muddy led me to want to guide others on the same wondrous path. It is an such honor to be able to work with these amazingly positive, supportive and really fun folks. Life is good! Hello Everyone !!! Here is a little bit about me. I was born and raised in North Dakota. I have been an active person my entire life. In my free time if I'm not at the box I enjoy playing different sports depending on the time of year you can catch me at the ball diamonds or the ice rink. I also enjoy hiking, kayaking, biking, hanging out with my friends and family. I have been doing CrossFit since 2015 and got my CardioXtreme certification from Foundation Krav Maga in the summer of 2017. Once I tried CrossFit I was hooked! While attending CrossFit classes I looked over and saw a group of people who hitting and kicking heavy bags and I thought to myself that looks like a lot of fun. So I talked to Gina and tried CardioXtreme and had a blast! I encourage you to come and try out CrossFit and CardioXtreme whether you're advanced athlete or brand new CrossFit and CardioXtreme is for you! I look forward to seeing you at Big Muddy!